The Blob (1958) is one of the classic monster movies made during the 1950s. Common origins for a lot of creatures from these kinds of movies were either as a result of atomic energy or from outer space. Irvin S. Yeaworth Jr.’s movie opts for the latter with a simple premise that is surprisingly effective and that’s due in large part to the no-nonsense direction, Theodore Simonson and Kate Phillips’ well-written screenplay, and an earnest yet grounded performance from then-newcomer Steve McQueen. A meteor from outer space crashes to Earth just outside of a small-town in the heart of America. Two young people – Steve Andrews (McQueen) and Jane Martin (Corsaut) witness the meteor’s descent and then en route to checking it out encounter an old man who found it. He appears to have some kind of gelatinous goo all over one of his hands. It came from the meteor and aggressively attached itself to him. Pretty soon, the stuff spreads across his body and continues to grow at an alarming rate becoming large enough to threaten the entire town. It’s up to Steve and Jane to warn everyone and try to stop it. The Blob is a fantastic fusion of the juvenile delinquent and horror genres. McQueen’s Steve is a bit of rebel, getting in trouble with the police when he races against rival hot-rodders. However, he steps up once the Blob is on the loose and wreaking havoc. Like most monster movies from this era, his initial warnings go unheeded because the police are unwilling to believe a young punk like him. What separates The Blob from the other creature features of that era is its refusal to go for obvious laughs and play things straight, which is quite something when you consider the inherent silliness of the monster – a slow-moving amorphous blob that absorbs people. And yet, it works because the filmmakers take it so seriously and the actors play it straight. As a result, we take it seriously. This is due in large part to Steve McQueen’s performance, which is grounded and present. He does a lot to sell the threat of the monster and the frustration Steve feels when no one takes him seriously about the creature. He brings a lot of conviction and natural charisma to the role. The Blob was made independently of Hollywood and is free from the constraints of a studio backlot. Shooting on location gives the movie much-needed realism by grounding the threat in actual locations. The Blob scared people back in the day because it took place in an environment that was easily relatable, anticipating like-minded horror films such as Carnival of Souls (1962) and Night of the Living Dead (1968). The Blob went on to become a cult classic, spawning a sequel and a decent remake in 1988 that amped up the special effects. As dated as it is to us now, the original still works and one can admire the craftsmanship involved, especially on such a low budget. The folks at the Criterion Collection have given The Blob a Blu-Ray upgrade and the film has never looked better with colors that are lush and vibrant. There are no artifacts or any visible blemishes on this pristine-looking transfer! There is an audio commentary by producer Jack Harris and film historian Bruce Eder. Harris starts of talking about the origins of The Blob – marrying the juvenile delinquent movie with a serious-minded monster movie. Naturally, he talks about casting Steve McQueen. He also touches upon the challenge of creating the time-consuming special effects. This is an engaging and informative track with lots of filming anecdotes. Also included is a commentary by director Irvin S. Yeaworth Jr. and actor Robert Fields. Yeaworth touches upon some of the same things as Harris, like the casting of McQueen and financing the movie. Fields talks about working with McQueen and shares some stories about working on The Blob. “Blobabilia!” is a gallery of memorabilia from the movie from the personal collection of Wes Shanks. 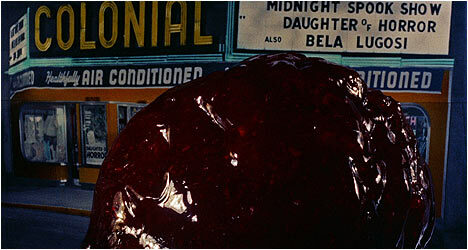 There are all kinds of behind-the-scenes photographs, posters, special effects props and the Blob itself. Finally, there is a vintage theatrical trailer.